Regular readers will realise that a primary purpose of these articles is to exhibit items from my collection and today I am displaying what I consider to be my most attractive chess book. 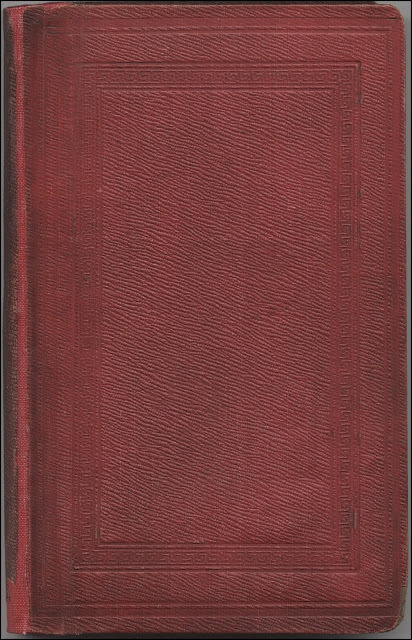 This is a specially bound copy of Amusements in Chess by Charles Tomlinson, published by John W. Parker, London, 1845, and was awarded as a prize in the English Mechanic Problem Solution Tourney of 1885. 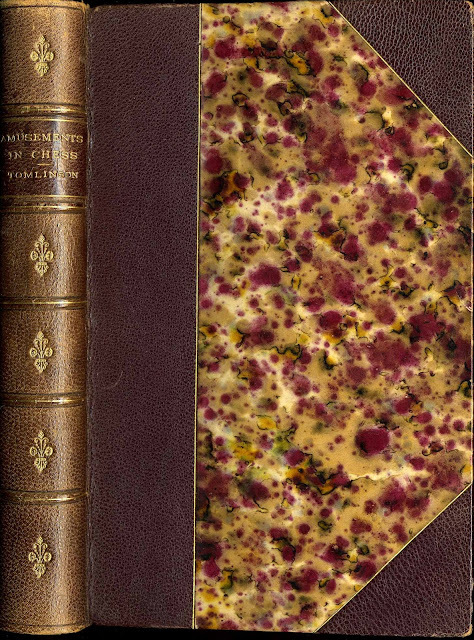 The book is beautifully bound in half leather and marbled boards with fine gilt rules. The spine is in six compartments with gilt titles, decorations and ruling in the raised bands. In his Preface Tomlinson gives a detailed account of the origins of this book; he had contributed a long series of articles on various aspects of the game which were published over four years in The Saturday Magazine, and these had been revised and rearranged into the present volume. Tomlinson's detailed history includes no original research but is taken from previous writers including Dr. Thomas Hyde, Sir William Jones, James Christie, Joseph Strutt and Sir Frederick Madden. 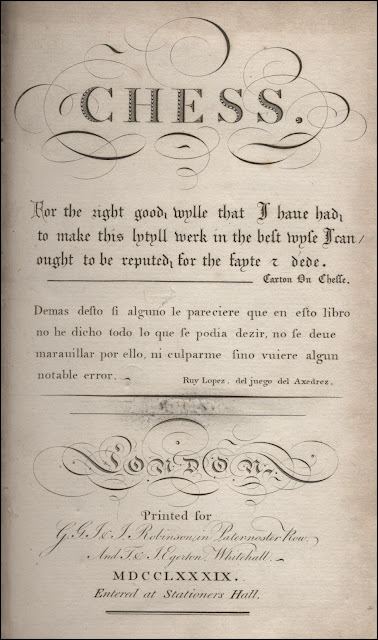 The author reaches no definite conclusions as to the origin of the game or of its introduction into Europe, but presents the various theories being discussed at the time. After chapters on the Character of the game and the Origin of the powers of the pieces, Tomlinson then discusses chess writers and players. He gives details of various ancient manuscripts on the game before surveying the classic printed works of Caxton, Vicente, Lucena, Damiano, Vida, Ruy Lopez, Gianutio, Salvio, Carrera, Gustavus Selenus, Greco, Saul, Bertin, Stamma, del Rio, Ponziani and Lolli. Many of these players and their books are discussed at great length and long extracts from some of these works are included. Tomlinson therefore had access to a number of early treatises, the details of which he found in the `copious catalogues´ of John Cochrane and George Walker. He does not say where he was able to examine these works but some of the information that he gives, including extracts from the works of Pope Innocent III and Caxton, was taken from the bibliographical works of Richard Twiss, Chess, published in London in 1787 and 1789. 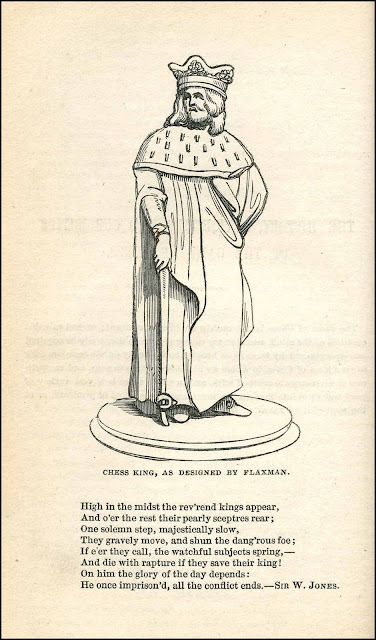 There is a Biographical Sketch of Philidor and a long chapter on The Automaton Chess-Player, with several line drawings illustrating its operation, taken from Robert Willis' pamphlet An Attempt to Analyse the Automaton Chess Player of Mr. de Kempelen, London, 1821. Part I of the book is completed by chapters on The Knight's Move, The Powers of the Pieces and Pawns and Chess without the Board. The first five Lessons in Part II of the book give general instructions and the laws of the game. The next nineteen Lessons discuss the various openings illustrated with complete games, and the final three Lessons are on end game play. This part of the book is interspersed with 41 problems on diagrams. Amusements in Chess was successful and, according to Tomlinson, received favourable notices from Howard Staunton and Elijah Williams. In one of a series of long articles on the History and Literature of Chess, signed B.S., in The Chess Player for October 1853, edited by Kling & Horwitz, the book was described as the best collation of chess researches which has yet appeared. These articles are reprinted in Chess Christmas by Ken Whyld, Olomouc, 2006. Tomlinson's other major chess work is The Chess-Player's Annual for the year 1856, published by Arthur Hall, Virtue and Co., London, 1856. The book is dedicated with `peculiar pleasure´ to the chess patron Lord Lyttelton, F.R.S., and in the preface Tomlinson declares that `should the public support the work, it will afford him unmingled satisfaction to continue it´. He also reveals that this book was written during an enforced break from his scientific duties due to an illness. 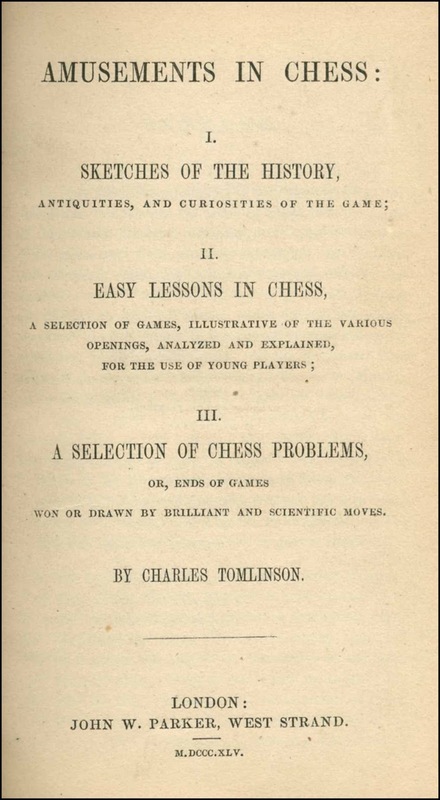 While Tomlinson's Amusements in Chess was compiled largely from the works of others, the preface to The Chess-Player's Annual promises that this volume was `prepared on the principle of admitting nothing that has once appeared in print´. He does not entirely adhere to this but most of the games and problems had not previously been published. The majority of the material in the book is by Tomlinson but there are also contributions from Capt. H.A. Kennedy, T.E. Cour, Mortimer Collins and various problemists. The studies were provided by Horwitz and Kling. Separating fact from fiction is sometimes difficult with Tomlinson's writings, as he can relate an episode in a very convincing manner. Take for example his story of the distinguished blindfold player Richard Rooke Rookewarden, in The British Chess Magazine for 1891 pages 380 to 388, which apparently fooled some readers. 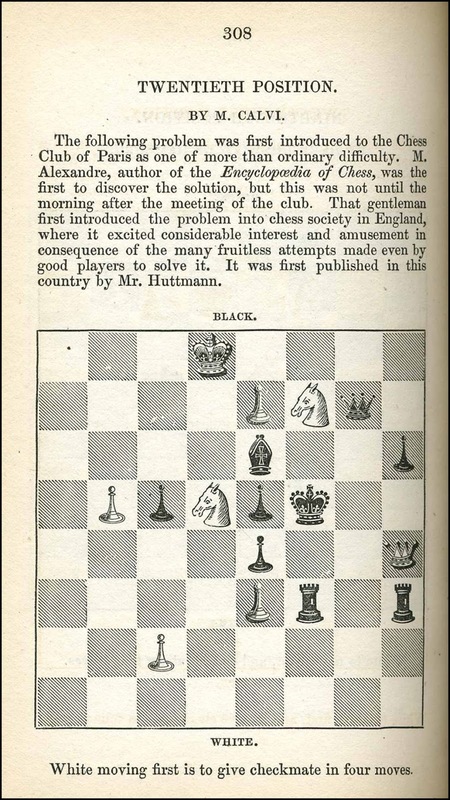 For further details see the feature article A Chess Hoax at Edward Winter's Chess Notes. 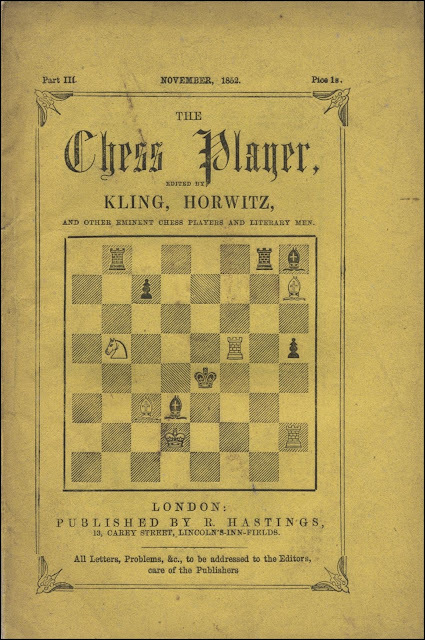 An essay in The Chess-Player's Annual, entitled A Consultation Game, narrates the story of a game, at Tomlinson's house, in which he consulted with three friends, against Herr Löwenthal. He identifies the friends only as Beta, Gamma and Delta, referring to himself as Alpha. Much interesting dialogue between the antagonists is related in the story and eventually, the game, being undecided, was adjourned to the following week. 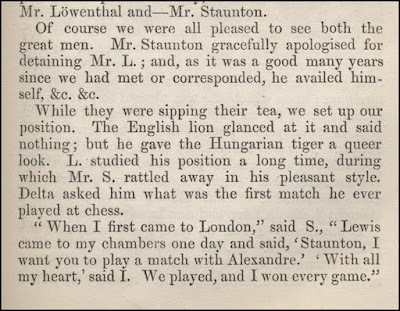 To Tomlinson's surprise, when Löwenthal returns he is accompanied by Howard Staunton and, while he does not take part in the resumed game, Staunton `rattled away in his pleasant style´, joined in the general conversation, and related various anecdotes. Perhaps this is a mixture of fact and fiction but, in any event, it gives an insight into how Tomlinson remembers Staunton in conversation. 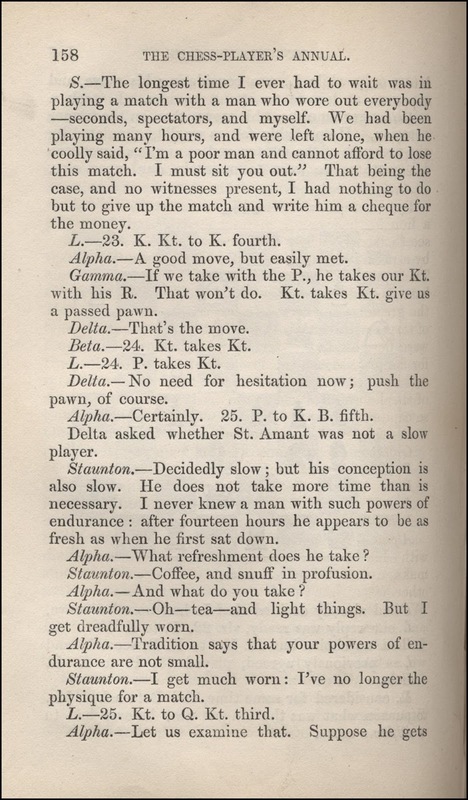 The alleged match between Staunton and Alexandre is discussed by John Townsend on pages 110 to 112 of his book Historical notes on some chess players, Wokingham, 2014. 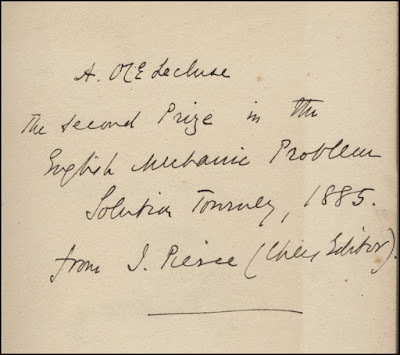 In another pleasing article entitled A Reminiscence of Mr. Huttmann's Chess Soirées, Tomlinson reveals that many of Huttmann's papers were consigned to him when Huttmann left the chess world. 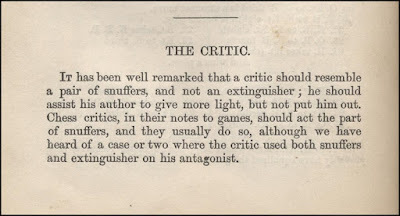 Some of the matter contained therein was used in his Amusements in Chess and further material, including a number of problems by William Bone, was now included in the present volume. All in all, a very entertaining Annual and it is unfortunate that Tomlinson did not receive sufficient encouragement to continue this work in later years. Tomlinson also wrote Chess: A Poem in Four Parts, London, 1854, and this was republished in 1891 with the title Chess: A Poem in four Cantos. 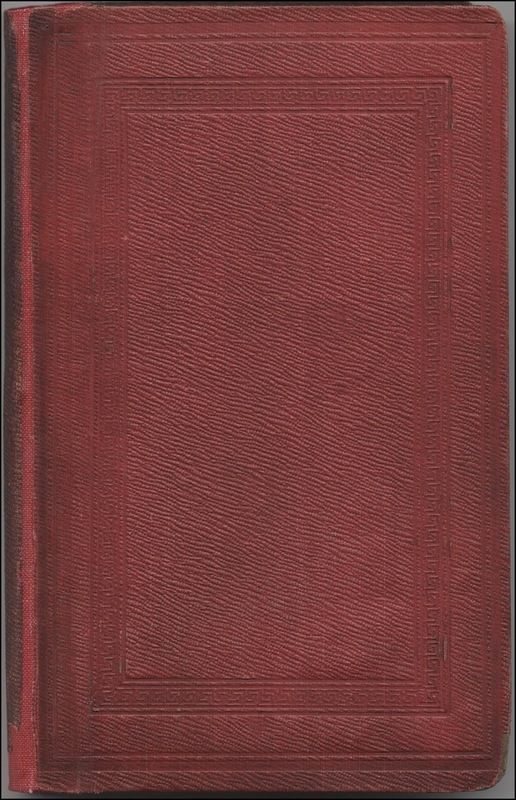 This included additional material including an essay Reminiscences of the Chess Divan; he also produced many articles on chess for a number of publications. Details of these will be included in a later article. Charles Tomlinson F.R.S. (1808-1897), author of four chess books and numerous articles on chess which were published in various periodicals and encyclopedias, wrote a very interesting autobiographical article, when aged 82, which was published in The British Chess Magazine in November 1891, pages 489 to 502, and when he died an unusually long obituary was published in The British Chess Magazine for March 1897 pages 109 to 114. 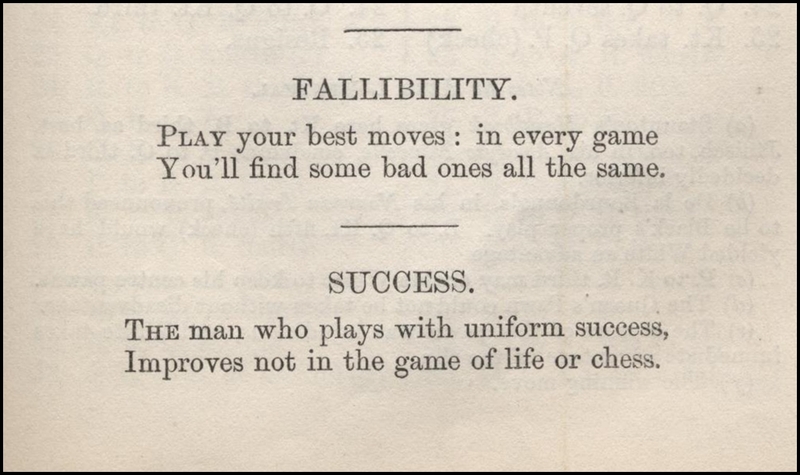 Much of this was taken from an article in Biograph and Review, London, 1881 with additional chess related material from Tomlinson's own article of 1891. 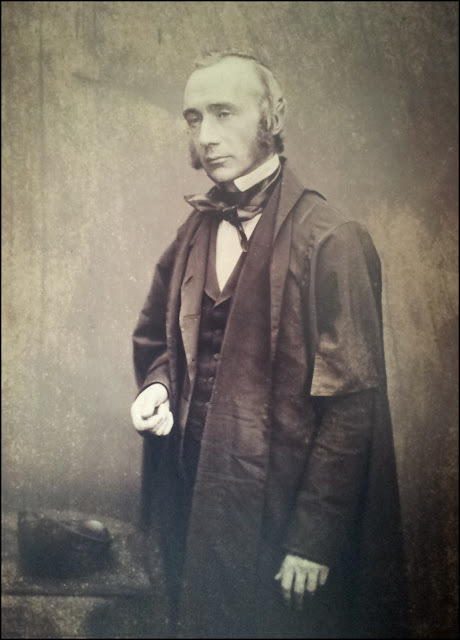 Tomlinson was first and foremost a highly regarded scientist and a 24 page article entitled The Life and Work of Charles Tomlinson FRS: A Career in Victorian Science and Technology, by Frederick Kurzer was published in Notes and Records of the Royal Society of London, volume 58 for May 2004, pages 203 to 226. This is available online and gives extensive details of Tomlinson's academic and scientific careers. 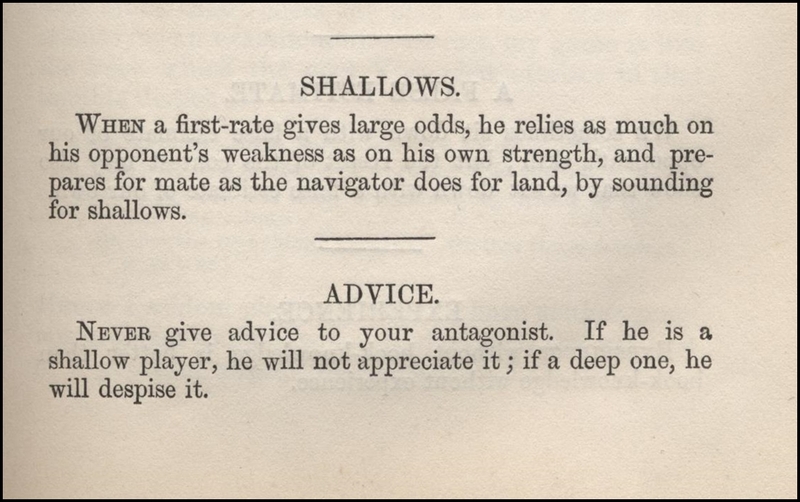 Although it has only one paragraph on his chess activities, it does include much useful general information about Tomlinson. Some of the information in these articles is contradictory but I have distilled Tomlinson's chess career largely from these three articles and a few additional sources. 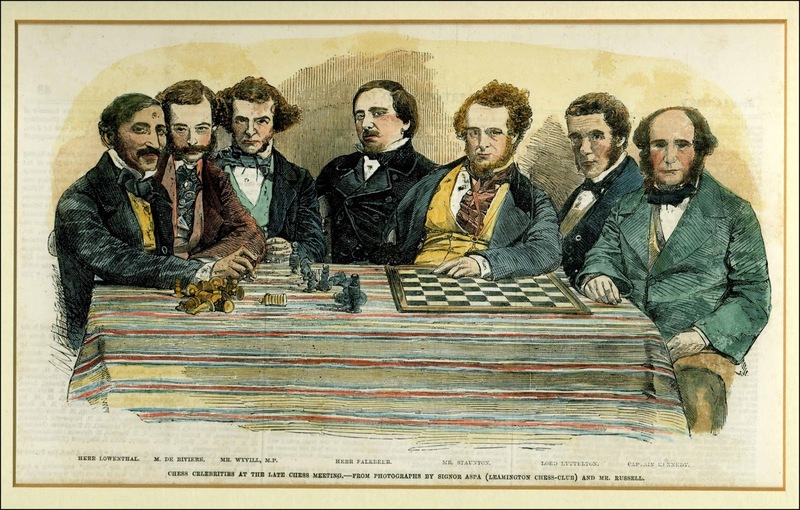 Tomlinson’s recollections are occasionally rambling and include much tittle-tattle, nevertheless, he gives a valuable and vivid portrayal of the 19th century chess scene. He had met, associated with, and played with many of the leading chess personalities of the 19th century. In particular he had close associations with Howard Staunton, with whom he corresponded for many years, Jacob Löwenthal, Rev. William Wayte and Ernst Falkbeer. 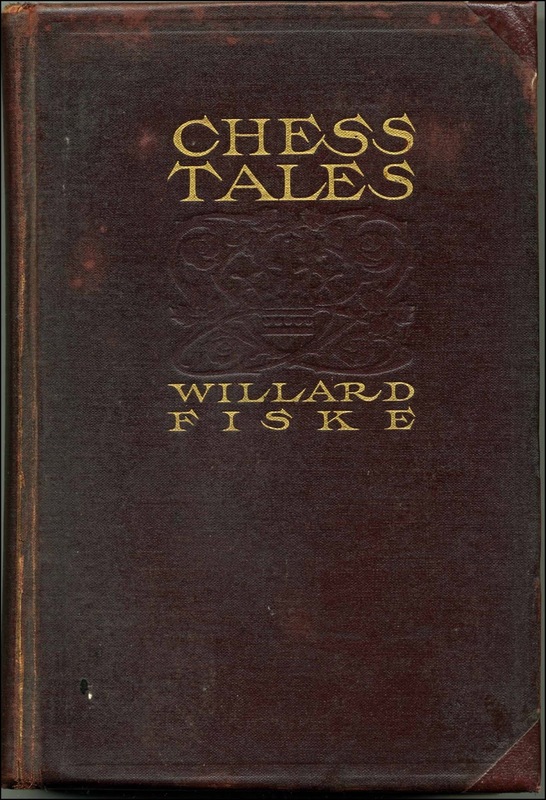 Tomlinson begins his autobiographical article by revealing that in 1863 he was asked by Daniel Willard Fiske, via Herr Löwenthal, to furnish a sketch of his life and an account of his writings on chess, as Fiske was preparing a bibliography of chess to be published at Leipzig, either in English or German. 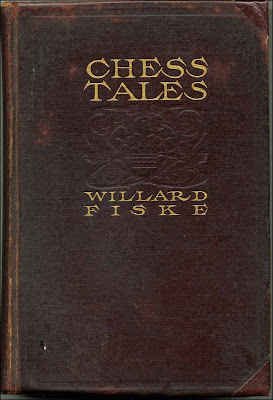 Fiske had already prepared an American chess bibliography which was included in The Book of the First American Chess Congress, New York, 1859, and several bibliographical articles by Fiske were included in his Chess Monthly periodicals; some of these were later reprinted in Chess Tales and Chess Miscellanies, London, 1912, however the proposed full bibliography never appeared. Charles Tomlinson was born in London on 27th November 1808 and learnt the moves of chess at the age of eight from his elder brother Lewis. 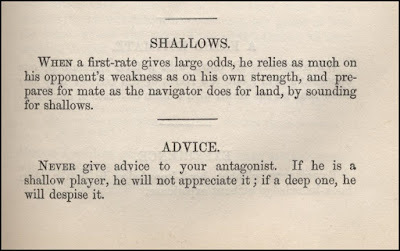 He occasionally visited a chess club in Lincoln’s Inn Fields, and took kindly to the game, however he had no opportunity for studying the game as he recalls `chess books were as rare as other forms of literature, and the only one that I heard of was a translation of Philidor’s well known treatise´. Nevertheless he progressed and, as stated, played with many of the prominent chess players of the time, generally receiving odds, although he played on even terms with Captain Evans and Aaron Alexandre for example. 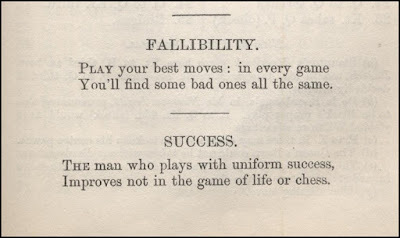 He published one of his wins, when receiving odds from Löwenthal, in his final chess book Chess, A Poem in Four Cantos, London, 1891, six of his games are included in his Chess-Player's Annual for the year 1856, and a loss, in 1844, against W. Henderson was published in The Bristol Chess Club, its History, Chief Players etc. 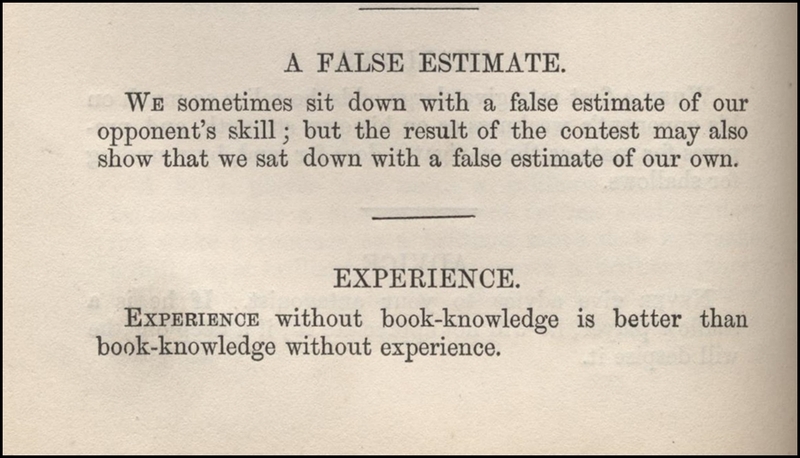 by J. Burt, Bristol, 1883. Tomlinson talks at length about Wolfgang von Kempelen’s Automaton Chess-Player and was enthralled by its exhibition in London in 1819. 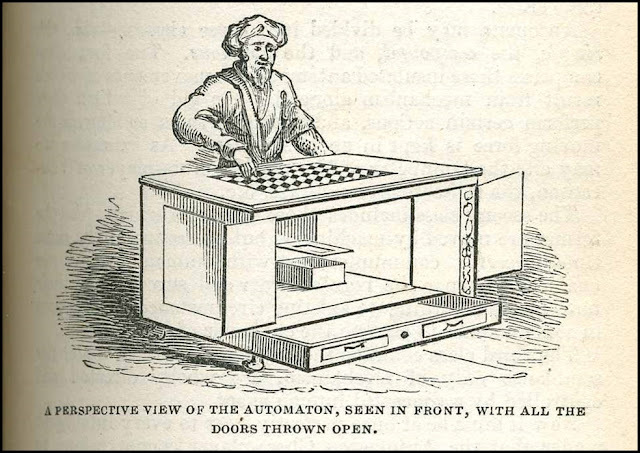 In the 1840’s Tomlinson published full details of the workings of the Automaton and included long extracts and diagrams taken from the pamphlet by Robert Willis, An Attempt to Analyse the Automaton Chess Player of Mr. de Kempelen, London, 1821. Willis informed Tomlinson that he wrote his pamphlet at the age of 18 although he would have been 20 or 21 when it was published in 1821. Charles and his brother Lewis both had a desire for learning and were admirable achievers in life from humble beginnings. They were sent to work at 12 or 13 after their father died leaving their mother in straitened circumstances. Lewis eventually attended Oxford University before opening his own school in Salisbury, while Charles became an eminent scientist, philosopher, meteorologist and linguist. He made some important scientific discoveries and wrote around 50 books and 100 papers and articles on scientific matters. He was a member of several learned societies and elected a Fellow of the Royal Society in 1867. Tomlinson’s first employment was as office boy to the noted architect Joseph Woods, a good chess player and a member of the London committee in the correspondence match between London and Edinburgh which took place from 1824 to 1828. The committee occasionally met at Woods’ chambers, where Tomlinson lodged, and he would surreptitiously observe their deliberations. He recalls the commotion caused by the famous incident where the London Club tried to retract a losing move after it had already been posted to Edinburgh. In 1830, not enjoying office work, Tomlinson moved into education and became a teacher of Latin and French. He later joined his brother at his school in Salisbury; he gave lectures at the local Mechanic’s Institute and helped to form a chess club there, becoming its president. Tomlinson was in correspondence with Staunton in the early 1840's and was able to gain a few subscribers for his newly launched Chess Player’s Chronicle. 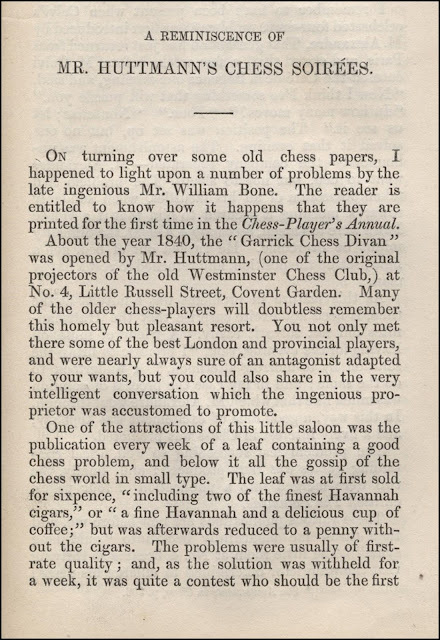 Tomlinson gives a lengthy account of J.H.Huttmann (spelt throughout the British Chess Magazine article as Hutman) and his chess divan where coffee and cigars were served to the patrons with the cigar wrapped in a paper containing a chess problem and gossip from the chess world. These papers were issued weekly from January to August 1840 and a paper with a chess game was also produced from March to August 1840. 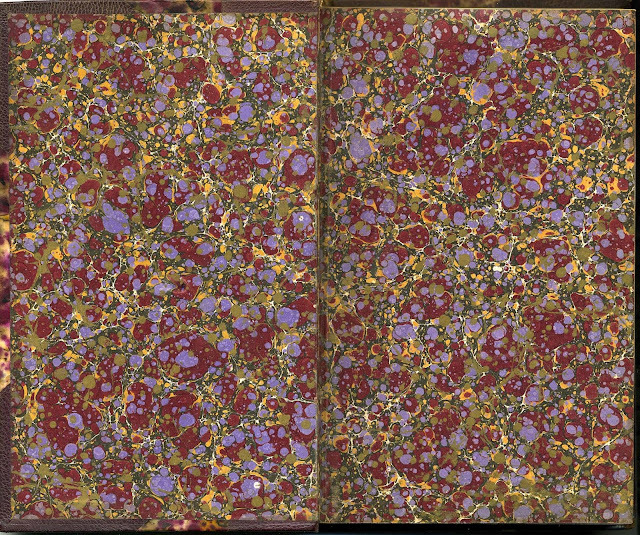 These two papers were then merged into the periodical The Palamede which continued until October 1841. Any copies of these papers or the periodical are very rare today. It was here that Tomlinson met William Lewis, George Walker (`but never together as they were at feud´), Staunton, and `several provincial players of repute´. Later, following the demise of Huttmann’s, he met Ignatz Kolisch, Falkbeer and Robert Brien, and talks of Brien's quarrel with Staunton and his unfortunate speculation in the Chess Player’s Chronicle which he had purchased from Staunton for the sum of £200, although `not then worth as many shillings´, according to Tomlinson. He also played Elijah Williams, Henderson and John Withers of the Bristol Chess Club. Tomlinson married Sarah Windsor, the younger sister of his brother's wife Maria, in Salisbury in 1839 and in 1842 moved back to London to become literary and scientific advisor to the London publishing house of J.W.Parker. 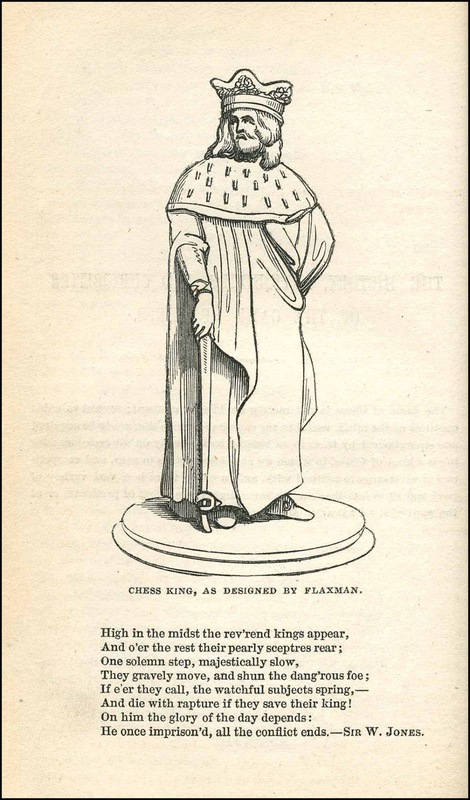 He wrote a series of papers for Parker's Saturday Magazine, on the history, antiquities and curiosities of chess, followed by a series of easy lessons and a selection of chess problems. 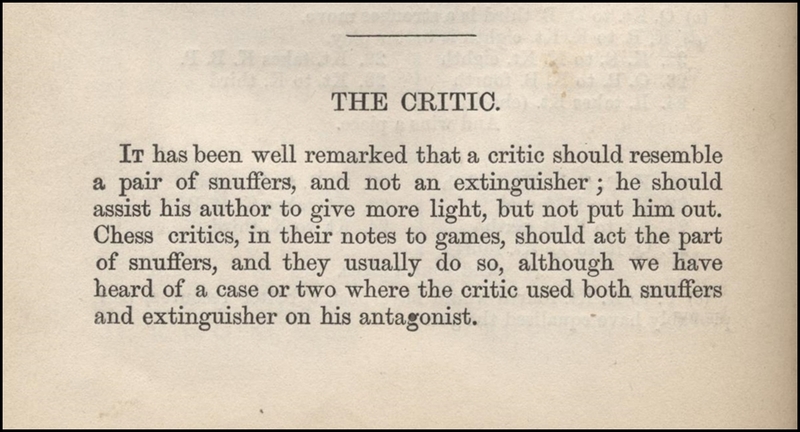 These papers were collected, revised and published in Amusements in Chess by J.W.Parker in 1845. 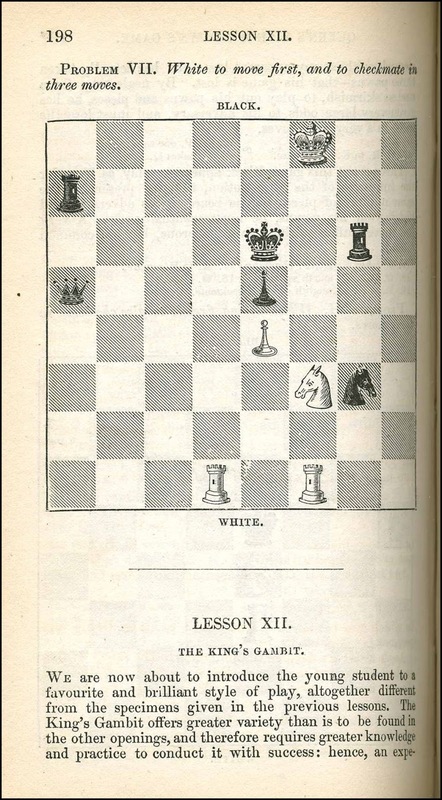 Tomlinson's story jumps ahead to 1855 when he attended the meeting of the British Chess Association at Leamington along with Bernhard Horwitz, Staunton, Capt. Kennedy, Löwenthal, Falkbeer etc., and it was here that several leading personalities were photographed by Signor Aspa and Mr. Russell. A well known group portrait, made up from photographs taken at Leamington, of Löwenthal, De Riviere, Wyvill, Falkbeer, Staunton, Lyttelton and Kennedy was published in the Illustrated London News in July 1855, page 59. Tomlinson sat on the committee, which was formed at Leamington, to consider a revision of the laws of chess. 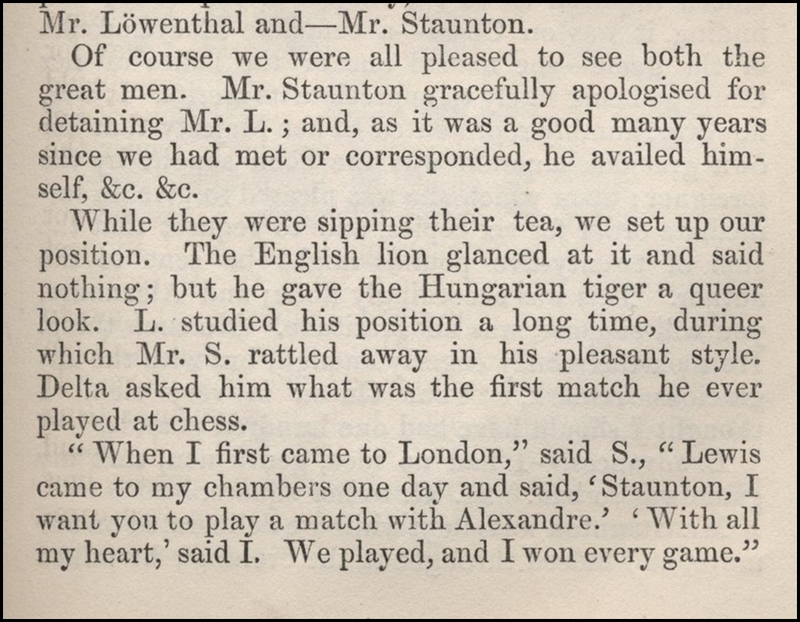 Fellow members were Löwenthal, Clement Ingleby, Wayte and Staunton, and the results of their deliberations were included in The Revised Code of Laws published in Staunton’s Chess Praxis, London 1860. 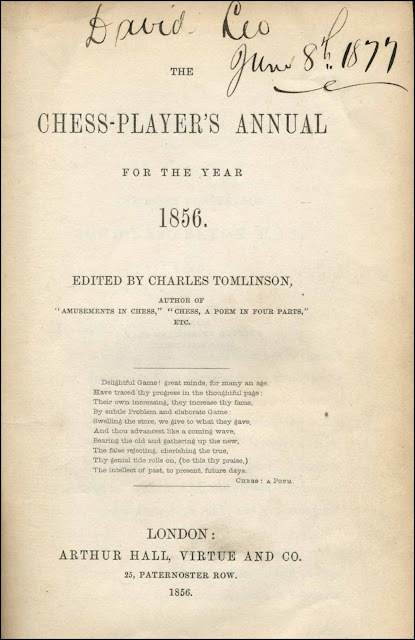 Two further works by Tomlinson were published in the 1850’s; Chess: A Poem in Four Parts, London, 1854, already described in 1884 as very rare by The British Chess Magazine, p437, and The Chess Player’s Annual for the Year 1856, London, 1856. Tomlinson states that he did not receive sufficient encouragement to continue this Annual in subsequent years. 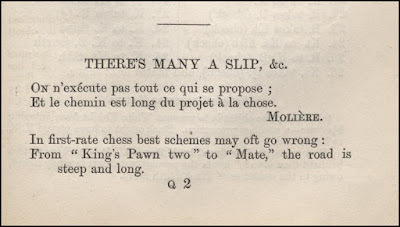 He contributed the article on chess to Charles Knight's English Cyclopeadia in 1859, and two of his poems appear in Fiske's Chess Monthly for 1858 and 1859. 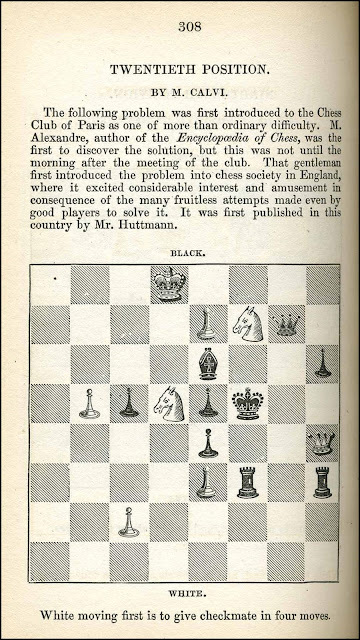 After this there appear to be no further chess writings or information on Tomlinson’s chess career until his contributions to The British Chess Magazine, starting in 1884. 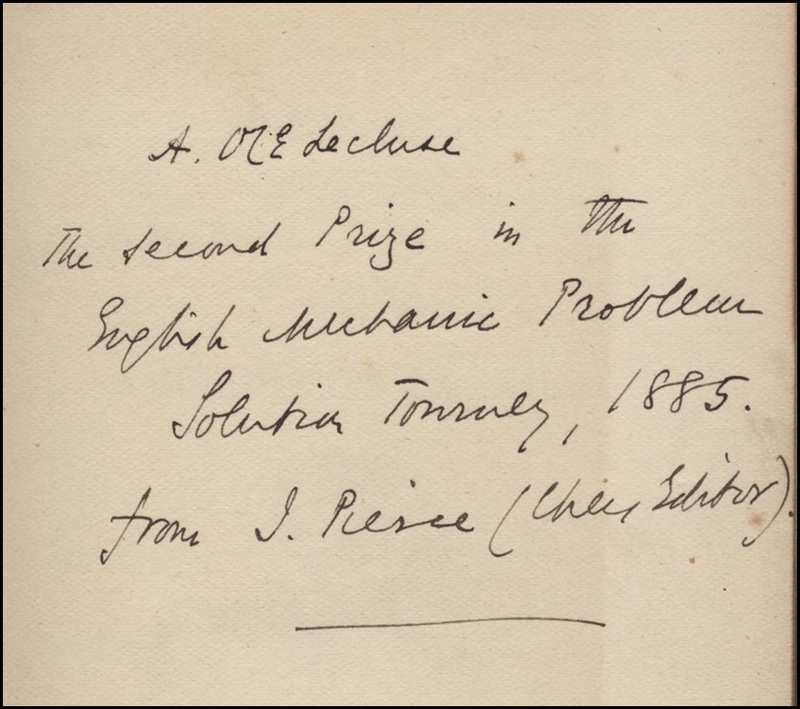 He did supply the information requested by Fiske in 1863 but this was never published. 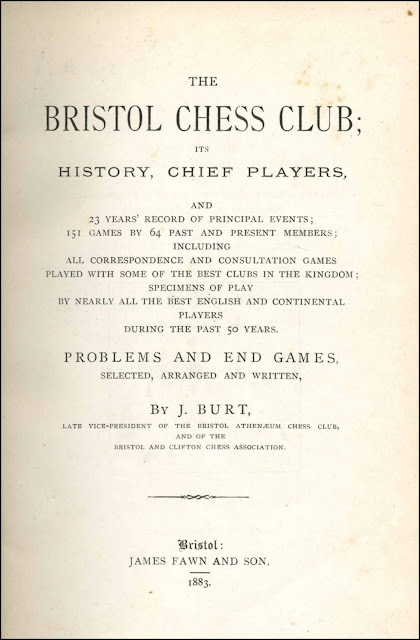 He contributed a number of poems, articles and stories to The British Chess Magazine from 1884 to 1897 and in 1891 the BCM acknowledged his numerous and valuable contributions stating that his sketches and reminiscences are the most permanent section of chess literature. Tomlinson had visited the Café de la Régence in Paris and was a regular at Simpson’s Divan from the 1820's. He gives a colourful account of the Divan in his essay Reminiscences of the Chess Divan which was published in The British Chess Magazine in February 1891. 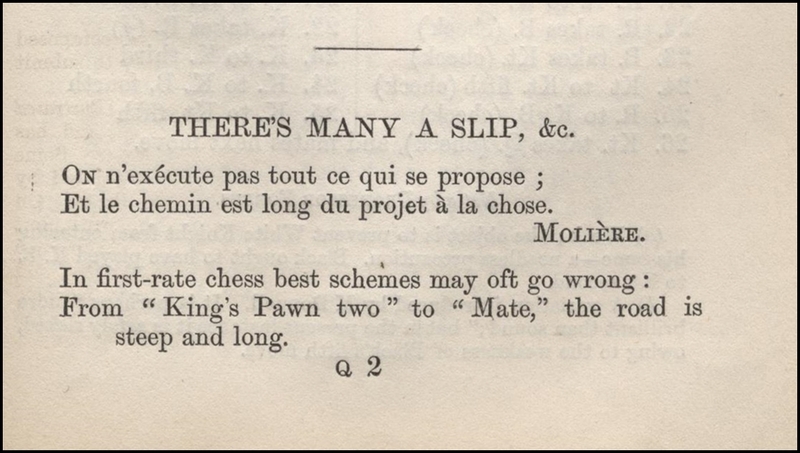 A much enlarged version of this article was included as an introduction to Chess: A Poem in Four Cantos, London, 1891. This last work is freely available as an ebook. Although frequently addressed in print as Professor Charles Tomlinson, particularly by The British Chess Magazine, I can find no mention of this title in either Tomlinson's own writings or in the authoritative biographical article published by the Royal Society. Tomlinson referred to himself as `the Professor´ in one of his fictional stories in The British Chess Magazine (1892 p22 etc.) however, although he was undoubtedly an eminent scientist, I have found no evidence that the title was ever formally bestowed on him. 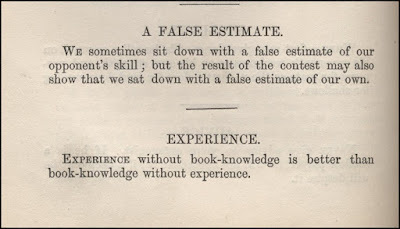 For someone who was so absorbed with chess and who had such strong connections in the chess world in the middle of the 19th century there are some surprising omissions from his chess curriculum vitae. 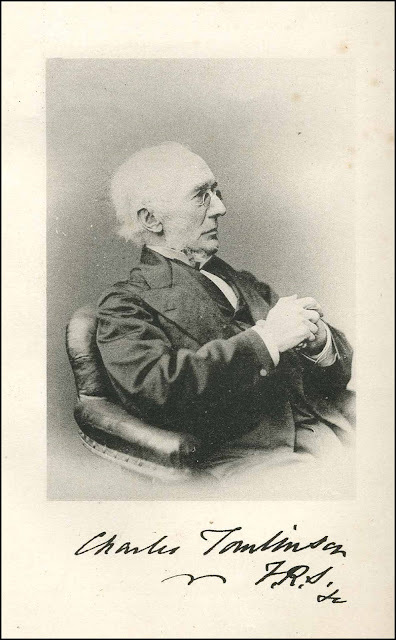 For example, although he attended the Great Exhibition of 1851 many times and wrote an elaborate account of it for his Cyclopaedia of Useful Arts, London, 1852, he never mentions the Chess Tournament which ran along side the Exhibition. Furthermore there are no references in Tomlinson's writings to Paul Morphy's achievements, or his visits to Europe. Frederick Kurzer, in the aforementioned article for the Royal Society, summarises Tomlinson as `an exceptionally versatile scientist of the Victorian era, who, in a long career as an educator, encyclopaedist and researcher contributed significantly to the advancement of science and technology.´ To this we can add that, during his leisure hours, he found time to become proficient at chess and enjoyed the company of many of the leading chess personalities of the 19th century. His extensive writings on the game were informative, educational and entertaining, and I will write about these in detail in my next article. Here's one you haven't got !